Rice balls. Teehee. So…I’m currently in a steamer recipe phase — soon to be pressure cooker phase. Steamed pearl rice balls are one of the items you are supposed to eat for Chinese New Year, but I love eating them all year round, so I made them for Christmas to share with friends. Yes, I’m ridiculously behind on my posts. You make them very similar to dumplings – in fact, they are probably easier to make than dumplings because you don’t have to wrap them. Pour the rice into a bowl and soak with water, covering roughly 1 inch above the rice. Soak for at least 2 hours at room temperature (overnight is good as well). Afterwards, drain the rice in a strainer, removing as much water as possible. 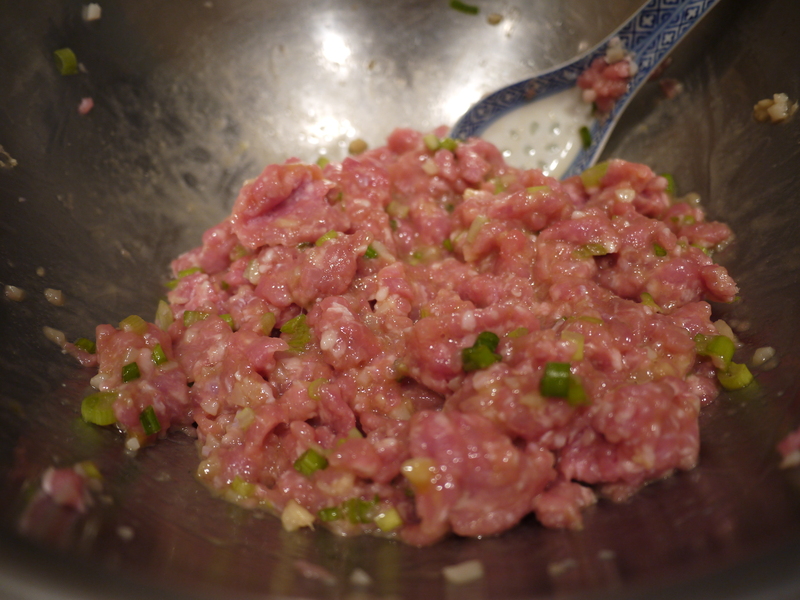 Mix the pork, water chestnuts, ginger, and green onions in a large bowl. In another bowl, mix the white pepper, cornstarch, rice wine, soy sauce, sesame oil, peanut oil, and egg together. Pour the liquid mixture into the larger bowl and mix thoroughly. Line a baking tray with parchment paper. Using an ice cream scooper and your palms, pass the pork back and forth until a round ball forms. Place on the parchment paper and repeat. Then, place the baking sheet in the freezer for 10-15 minutes to firm up the rice balls. Meanwhile, line a steamer tray with parchment paper. Fill the bottom layer of the steamer with water and ready to boil. Transfer the rice (pat dry with paper towels, if necessary) to a small bowl. 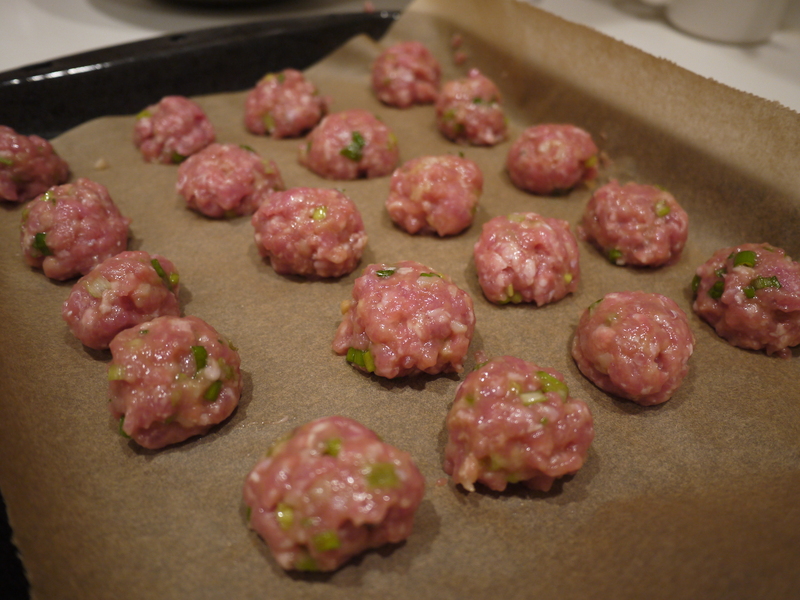 Remove the pork balls from the freezer. 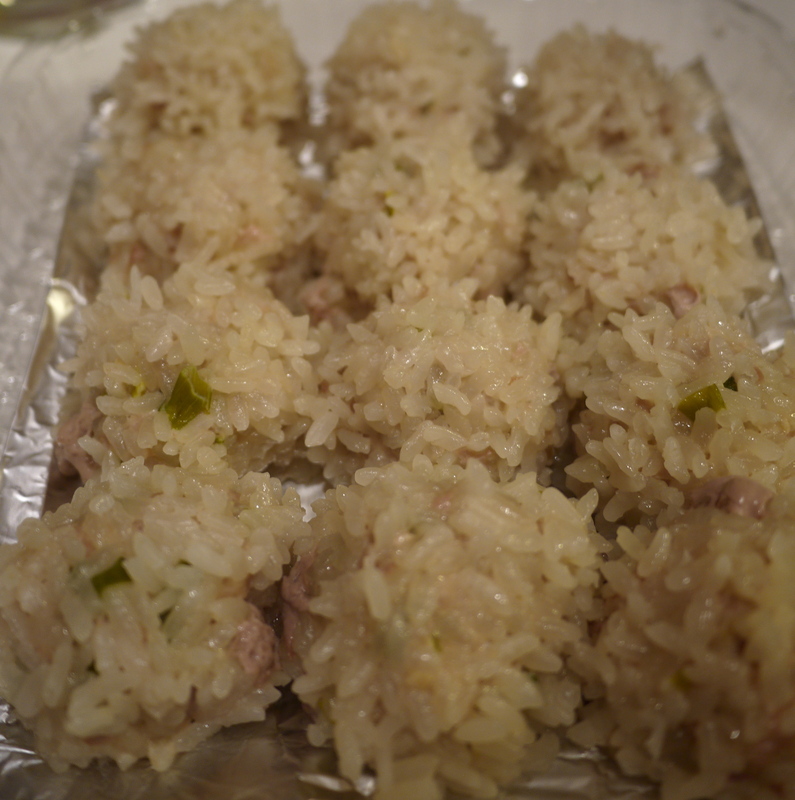 Roll the balls in rice, trying to cover the full surface in a single layer of rice. 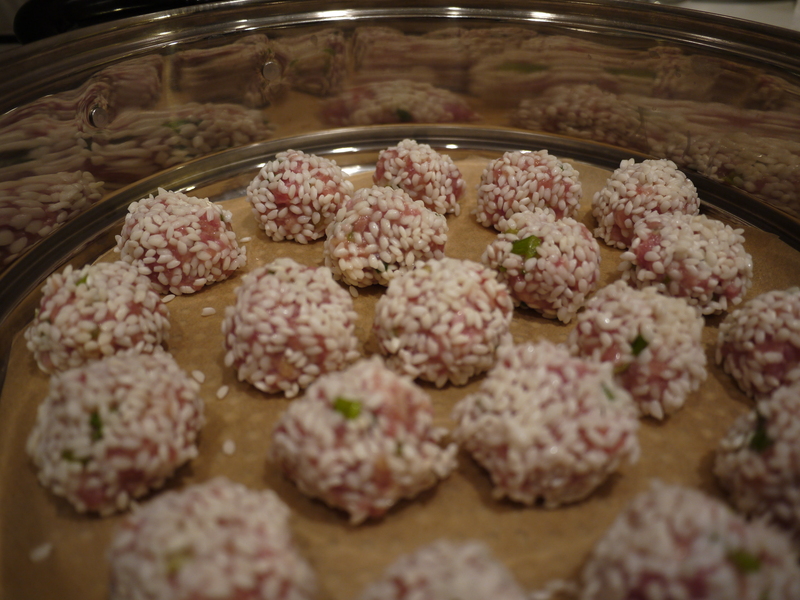 When done, line the pork balls in the steamer tray with parchment paper roughly 1/2 inch apart. Steam the dumplings over boiling water for 20 minutes. Serve immediately. They are good by themselves or you can serve them with a soy sauce + chili garlic sauce mixture. They taste delicious at room temperature as well. All packed and ready to be eaten! Pingback: Home Cooked Chinese Meal – VAYA!